KV CRPF Guwahati Recruitment 2018 for PGT/ TGT/ PRT/Nurse/Coach/ Counselor/Instructor/Teacher jobs in Kendriya Vidyalaya Khanapara Guwahati. 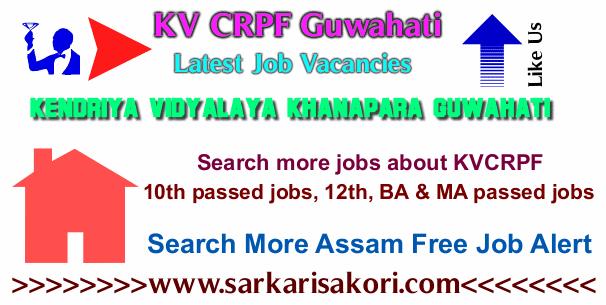 KV CRPF Guwahati Recruitment 2018 conducting an interview for filling up PGT/ TGT/ PRT/Nurse/Coach/ Counsellor/Instructor/Doctor/Teacher jobs in Kendriya Vidyalaya Khanapara Guwahati for the preparation of the Panel of Contractual teachers on a part-time basis for the session 2017-18 as per KVS norms. Qualification: Candidates should have Master Degree in respective subject with 50% marks aggregate and in the respective subject along with B.Ed. Qualification: Candidates should be Graduation in respective subject with 50% marks aggregate and in respective subjects with B. Ed. CTET qualified will be preferred. Qualification: Candidates should be Intermediate or equivalent with 50% marks and JBT of a duration of not less than 2 years/B.EI.Ed/B Ed/CTET qualified will be preferred. Qualification: Candidates should have BA/B.sc/M.A./M. Sc. psychology or M. Ed. with a certificate or diploma in counseling, Minimum one year experience in providing career/educational counseling, to the student at school or working knowledge and experience in placement bureaus or registration with rehabilitation council of India or vocational counselor. Qualification: Candidates should have National Certificate holder /B.P.Ed/Coaching diploma. Qualification: Candidates should be MBBS and Registered with MCI. Qualification: Candidates should have Diploma in Nursing. Qualification: Candidates should have DOEACC O & A level /Degree/ PGDCA from a recognized university. Qualification : Graduate in any subject or equivalent from a recognized University. One year training in Yoga from a recognized Institute. (i) PGTs All Subjects, Counsellor, Computer Instructor, Coaches and Yoga Teacher on 25/02/2017. (ii) TGTs All Subjects including Assamese language, Doctor and Nurse on 27/02/2017. Candidates will be required to attend a walk-in interview. * Interested and eligible candidates may apply application submitted on specific proforma available on the website www.kvcrpf.ac.in and also available in the school between 10.00 am to 2.00 pm on working days. A Candidate is requested to submit separate application forms if he/she indent for applying more than one post. Complete application form along with attested copies of all documents should be reached the office address within time. IDBI Bank Executive Recruitment 2018. Last Date for submitting an application: 20-02-2018. PGTs All Subjects, Counsellor, Computer Instructor, Coaches and Yoga Teacher on 25-02-2017. TGTs All Subjects including Assamese language, Doctor, and Nurse on 27-02-2017. Note: Candidates are requested to bring all the originals for the verification on the date of interview. All the KVS norms will be applicable. All important information regarding KV CRPF Guwahati Recruitment 2018 are given above please check them correctly.